Where does a soul go after one’s life is over? Does it drift away into nothing while the body returns to dust? Or does it goes on to rest, to be resurrected? Or does it recycle back into the physical plane of existence in yet another form? These questions always come to mind as we see, feel and live the experience called life. 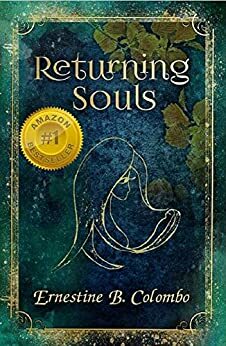 Returning Souls by Ernestine B. Colombo is a unique book that allowed me to connect with the characters and allowed me to visualize not only the descriptions the author presents but also the struggles and emotions the characters go through in the story. The story starts by presenting our protagonist, Evelyn D’Arico or Evie and takes her point of view. The beginning is captivating as we find the character lying on the floor, incapacitated and on the edge of death. The narrative masterfully captures the emotions you might have if you were to find yourself in the same predicament. The descriptions easily come as they paint some dramatic pictures. The language is fluid and allows you to get lost in the story. I particularly liked the author’s presentation of the behavior of the pets. I always believe that animals are more attuned to the metaphysical plane of souls and spirits. The story, to me, presents a unique idea that I have not read in any piece of literature, the concept of Pre-incarnation. As the story progresses the reader gets to know a different character, Astara. She is a girl a little over 12, living in the Mesolithic time period. She is a unique complement to Evie’s character. Switching between the two characters points of view is handled expertly and I enjoyed being able to inhabit both of these two fascinating characters. The story is touching as well as we get to learn of her sister who is suffering from Down syndrome. This for me, was one of the more emotional elements to the story that left the character endearing. The relationship was believable and the condition, I thought, was explained with care. This book will take you on a reincarnation adventure with a deep look at the beauty, and maybe even the futility, of life. This is a must read for people coming of age or people looking for a metaphysical story that stands out from the rest as different and compelling.